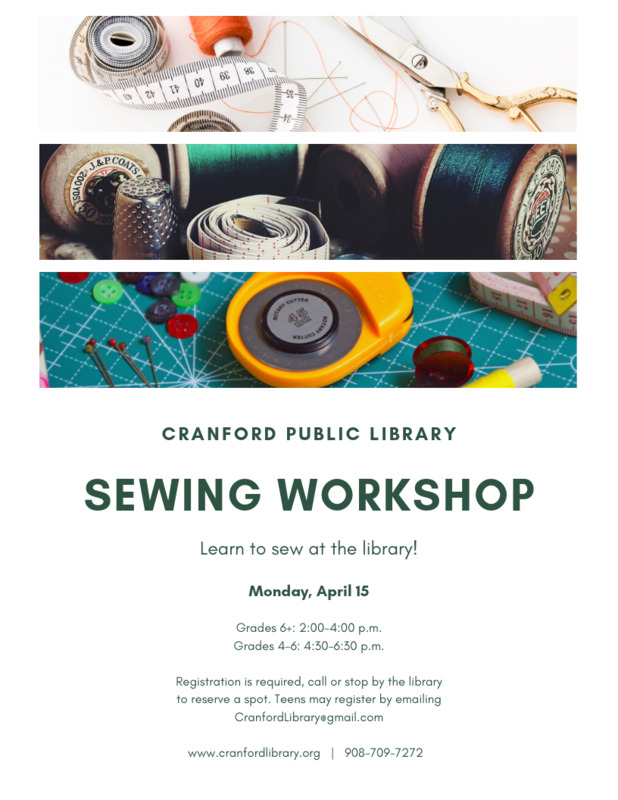 Learn how to sew at the library! We'll be offering an introductory sewing class for teens and tweens with instructor and sewing enthusiast Ellen Brown. Ms. Brown brings a portable sewing studio, including sewing machines, fabric, equipment and supplies. Participants will spend two hours creating a project that they are able to take home. The program is a great way to get hands on while learning an invaluable life skill! A session for teens in grades 6+ will be held from 2:00-4:00 on Monday, April 15, and a session for tweens in grades 4-6 will be held on the same day from 4:30-6:30 p.m. This free program is sponsored by the Friends of the Library. Registration is required and begins on April 1, space is limited. Tweens may reserve a spot by calling the library, interested teens should email CranfordLibrary@gmail.com to enroll.